In a former animal testing lab in North London, Greenpeace have been busy building their home since 1990. Placing ecological, social and community values to the forefront of their thinking – together with a participatory design process – we worked together to design and build the next evolution of their workplace. Hacking a new version of our original desk with designers Retty, Andrew and Csaba, designing and making a prototype storage solution to incorporate planting, and showcasing our adjustable-height desks, the Opendesk for Greenpeace collaboration was a fruitful and engaging one that we very much enjoyed. 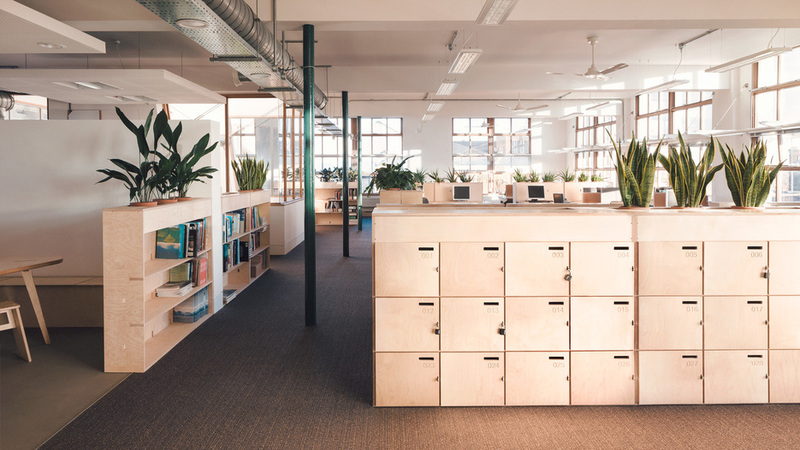 Starting with many shared values including minimising environmental impact and maximising economic benefits to the local area, Greenpeace asked Opendesk to find a series of makers that would be ideally within a cycle ride from their Islington HQ. We connected Factory Settings in Leyton and Wooden Horse in Hackney Central and a series of workshop visits ensued, developing some of our core range of products and prototyping some new ones. Overall Opendesk refitted an open-plan area of 750 sqm, showcasing a range of products; including the variant of the Lean Desk, Standing Desk in two lengths and the new Half Desk. Elsewhere our Cafe and Meeting Tables were adapted to meet individual space requirements and a storage system of bookcases and lockers with integrated planting was introduced to divide open-plan areas. This created privacy and reduced background noise whilst maintaining the open, collaborative environment and refreshingly ‘corridor-free’ spatial arrangement. Would you like to create an inspiring workplace like Greenpeace? If you’ve already browsed our designs and know what you want, add them to your basket and request quotes from local makers today. If you need a little help getting started, fill out the Workspace Enquiry form and we’ll be in touch.